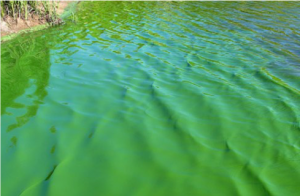 This summer, you may have read about the growing problem of harmful algal blooms (HABs1) due to cyanobacteria in lakes, rivers, and other freshwater bodies across the United States and worldwide. In 2014, we wrote about the 500,000 residents in and around Toledo, Ohio, who were alerted that their tap water had been declared undrinkable. That unprecedented event was the result of a localized HAB in Lake Erie, the source of tap water in Toledo, which overwhelmed their drinking water treatment plant. Cyanobacteria are a diverse group of photosynthetic bacteria that can live and thrive in many types of water. While critical to aquatic ecosystems, rapid, excessive cyanobacteria growth is commonly called a bloom that can be of ecological significance. Moreover, because they were formerly known as blue-green algae, their blooms are still collectively called HABs. Low water flow and high water temperatures along with elevated nutrients (primarily nitrogen and phosphorus) from both point (e.g., wastewater plant discharges) and nonpoint (e.g., agricultural and stormwater runoff) sources favor cyanobacteria blooms. For these reasons, blooms most commonly occur in summer and early fall months in lakes, ponds, or reservoirs, but can occur in rivers and could be year-round. Cyanobacteria blooms often look like thick scum or paint-like substances in differing colors on the surface of the water that can sink to the bottom overnight, only to reappear during the day. Moreover, some—but not all—cyanobacteria blooms release one or more toxins (called cyanotoxins3) in potentially high levels, such HABs can pose health risks to humans and pets, in addition to wildlife. Cyanobacteria blooms and cyanotoxins can also create significant taste and odor problems in drinking water, interfere with treatment performance, and potentially affect disinfection byproduct formation. Source: US Environmental Protection Agency (EPA), 2016. Earlier this summer in Salem, Oregon, HAB conditions and cyanotoxin concentrations led city and state officials to issue, in conjunction with extensive social media, a do-not-drink advisory for children under 6 years old and vulnerable adults that extended for almost a month. They also recommended that pets should not drink the water. By the time the advisory was lifted, the city had established multiple water distribution centers, purchased an automated system to allow same-day cyanotoxin test results, and tested a pretreatment system using powdered activated carbon to remove cyanotoxins. An increasing number of states such as Ohio have online resources and guidance about cyanobacteria and other HABs, but in 2015 EPA released a strategic plan to assess and manage these risks in drinking water, including improved understanding of the health effects of cyanotoxins, factors that cause HABs, analytical methods, monitoring and treatment options, and source water protection. Perhaps the biggest challenge will be improving the control of nutrient loading that contributes to cyanobacteria blooms and HABs in the freshwater bodies that supply the majority of US drinking water. The ongoing efforts by water professionals have strived to address these and emerging challenges as we continue to learn more about cyanobacteria and their toxins. 1The term “HABs” more properly refers to blooms of simple plants that live in marine and freshwater called algae; such algal blooms can produce harmful red tides and cause other adverse ecological and public health effects. 2See American Water Works Association and Water Research Foundation (AWWA/WRF) 2015. 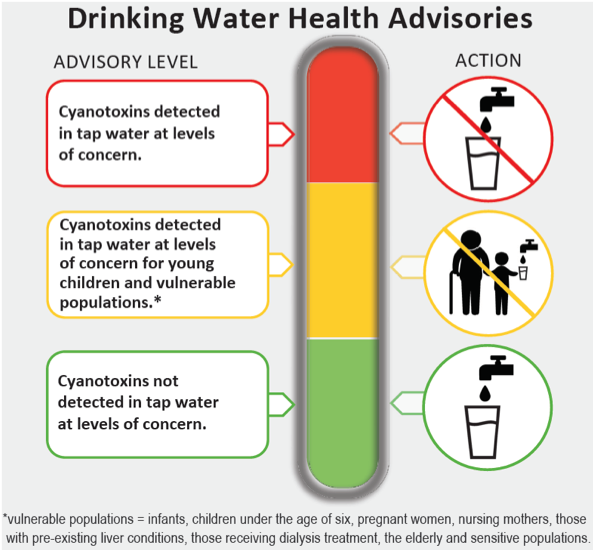 A Water Utility Manager’s Guide to Cyanotoxins. Available: http://www.waterrf.org/PublicReportLibrary/4548a.pdf. 3There are four major classes of cyanotoxins: microcystin, anatoxin-a, cylindrospermopsin, and saxitoxin. Persons consuming cyanotoxins are most at risk of upset stomach, vomiting and diarrhea, but liver and kidney damage are also possible. Microcystins are the most common and frequently studied cyanotoxin (AWWA/WRF, 2015). 4In 2015, EPA established 10-day Health Advisory exposure levels of 0.3 micrograms per liter (parts per billion or ppb) for microcystins and 0.7 ppb for cylindrospermopsin in drinking water to protect children less than six years old and vulnerable adults. Slightly higher HA levels were also established for older children and adults. EPA Health Advisories are non-regulatory, informal technical guidance to assist federal, state, and local officials, as well as managers of public or community water systems, to protect public health from contaminants. See also EPA, 2015.